It looked like the long-running war was going to get capped at 85 years, but in 1422, Henry V of England and Charles VI of France both died. That pushed the restart button. Henry was succeeded as King of England by his nine-month-old son Henry VI, whose royal proclamations included things like “na-na-na-na” and “goo-goo”. He was advised (if that’s the right word) by two uncles who happened to be scheming against each other. The situation in France wasn’t much better. You’ll recall that King Charles VI had disavowed his own heirs and, under the terms of the Treaty of Troyes (1420) acknowledged Henry V as his successor. The rumor was that Charles’s legitimate heir was, well, illegitimate, the result of an affair the queen had with her brother-in-law. That all seemed pretty harsh to the Dauphin (the title given to the heir-apparent of the French throne). He aspired to become Charles VII, but got chased out of Paris while civil war raged in France. The Dauphin, who was a teenager, set up his palace in a two-bedroom condo south of the Loire Valley; his “kingdom” extended approximately from his garage down to the liquor store at the corner. Into this mess stepped the most remarkable figure of the entire Hundred Years’ War: Joan of Arc. A peasant girl, she talked her way into an audience with the Dauphin and informed him that through visions, God had instructed her to lead the French army to victory and get the Dauphin crowned king. Joan must have been incredibly charismatic. Think about it: If you were in the Dauphin’s position and a 17-year-old girl tells you that fantastic story, would you be inclined to say, “Great! Go for it!” It could be argued that at that point, the Dauphin Charles didn’t have much left to lose, so why not give her a shot. Anyway, he let Joan lead a small army; they headed off to Orléans, which had been besieged by the English for several months. Within a few days of their arrival in April, 1429, Joan and her troops defeated the English, lifting the Siege of Orléans. That victory got the French fired up again, and is now considered the turning point in the Hundred Years’ War. 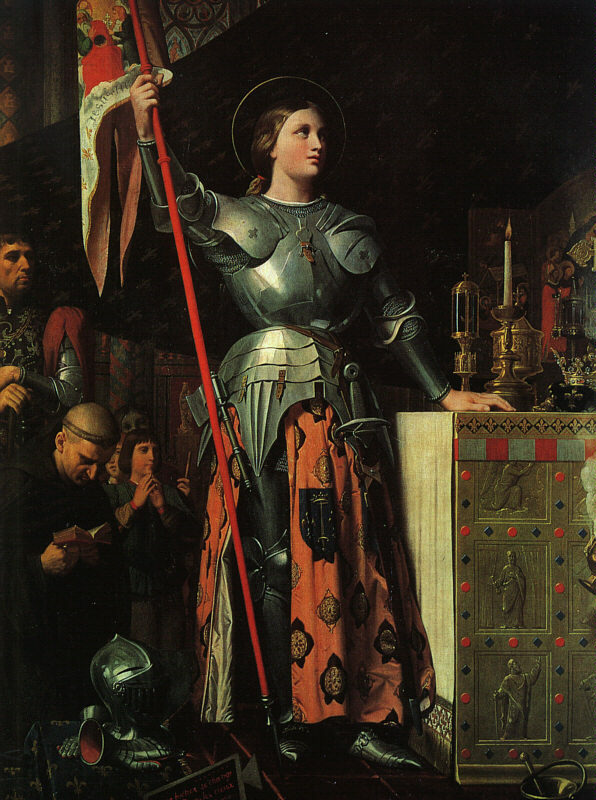 Jeanne d’Arc, as she is known in France, then led her soldiers to victory in other battles and was present in Reims when the Dauphin was crowned Charles VII. Thanks to “the Maid of Orléans”, the French army was energized and eager to win back territory held by the English. Unfortunately for Joan, in May of 1430 she was captured by troops loyal to the Duke of Burgundy, who eventually sold her to the English. When the subject of ransoming this unusual prisoner of war came up, Charles VII (who wouldn’t have been king without her help) was apparently hiding under the bed. Joan was alone, on her own. The English gave her a show trial before burning her at the stake on May 30, 1431. The war went on for another couple of decades, basically ending after the Battle of Castillon on July 17, 1453. This enabled the English to turn their full attention to fighting each other again, notably in the War of the Roses (1455-1485). No official treaty between the French and the English was ever signed. The English had their king; the French had theirs. The English did continue to hold Calais until 1558 — which means that when it was finally over, things were left pretty much as they had been at the outset of the Hundred Years’ War. This entry was posted in History and tagged Charles VII, Henry VI, Joan of Arc, Siege of Orleans, The Hundred Years' War. Bookmark the permalink. A young woman, recipient of visions in a small French village, armed with a sword she said would be found at the church of St. Catherine de Fierbois behind the altar. I like Joan of Arc best of all my books; and it is the best; I know it perfectly well. And besides, it furnished me seven times the pleasure afforded me by any of the others; twelve years of preparation, and two years of writing. The others need no preparation and got none. In large towns and small villages in France, you will find the stone memorabilia honoring her short life. Every artist’s rendition is different. She is portrayed as an equestrian warrior, a gentle maiden or praying penitent. I have tried to sketch her face, but to no avail. There is mystery, the vibrancy of youth and passion fueled by proximity to saints and angels. Perhaps like Twain, I need more preparation. She’s been an inspiration to a lot of writers and composers and artists down through the centuries, that’s for sure. Thanks for sharing the quote from Mark Twain — and good luck on your likeness of Joan.